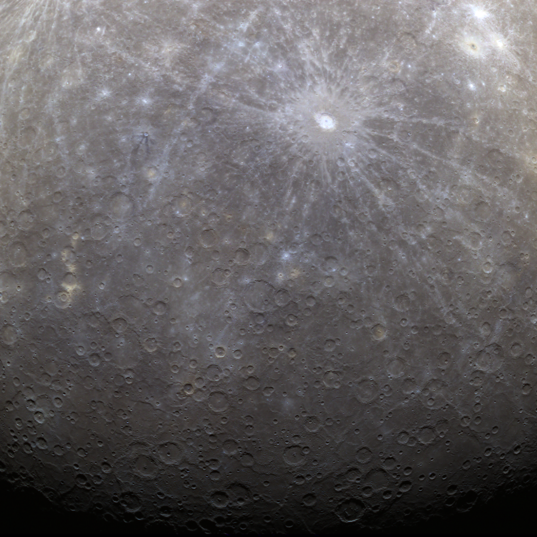 Today the MESSENGER mission held a press briefing to show off some of the first images and other data that are streaming in from the spacecraft, now that it has entered Mercury orbit. Before I get to the more substantial stuff I'll just post my favorite image released today, a dramatically lit view of terrain near the north pole, terrain that hasn't before been viewed by a spacecraft. 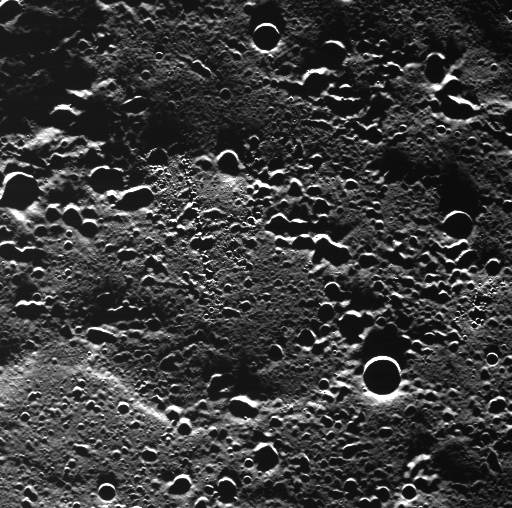 It's covered with secondaries; there are chains of craters; and the low lighting makes it easy to spot the characteristic undulating ridge of one of Mercury's ubiquitous thrust faults, signs that the entire planet has shrunk. A wide-angle camera view of terrain near Mercury's north pole, taken on MESSENGER's first orbit, shows an area blanketed by secondary impact craters, craters that formed when ejecta from a nearby, larger impact crashed into the ground. Only the sharp-rimmed craters are "primaries." The view is close to the north pole so the Sun is nearly on the horizon, throwing long shadows and failing to shine into the bottoms of craters. The image covers an area about 84 kilometers square. Although the camera is capable of capturing images that are 1024 pixels square, this one is only 512 pixels square. They're not holding back any data; the image was reduced in size ("downsampled") aboard the spacecraft before being transmitted to Earth in order to save on file storage space and transmission time. For their global map they don't need more data than that, not from the parts of the orbit that are near closest approach, anyway; I'm sure they're downlinking the full-resolution data from the parts of the orbit that have the spacecraft at much greater distance from the planet. Most of the press on the phone call seem not to have paid much attention to the mission before (several of the major science reporters and bloggers I know were either not listening in or didn't ask questions), so there wasn't really much new information discussed. Just two things stuck out in my mind from the briefing. One was this slide. The data isn't really all that significant, yet. 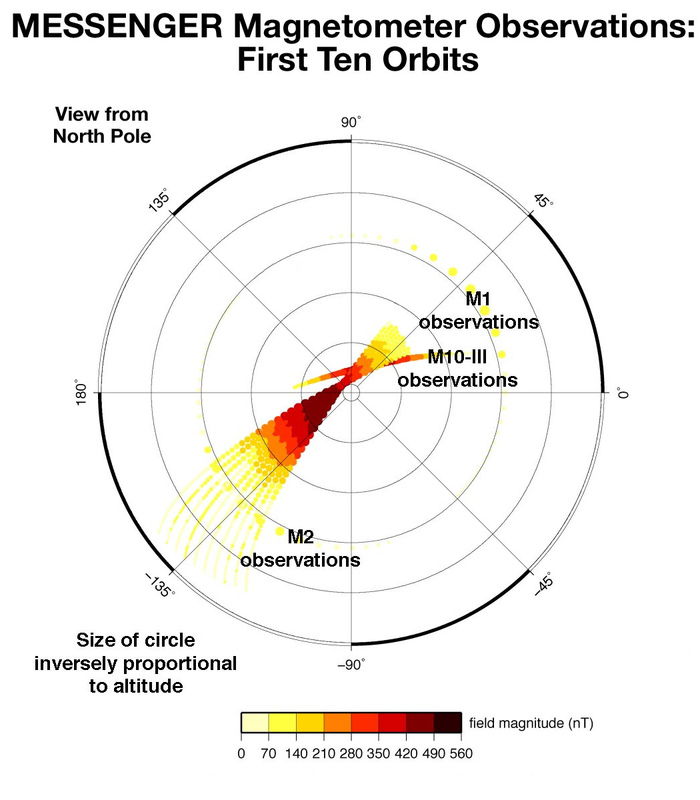 It just shows five days of measurements -- ten orbits -- from MESSENGER's magnetometer, superimposed on the previous measurements captured in all six previous flybys, by Mariner 10 and MESSENGER. It's just the barest beginning of what MESSENGER will get in a mission lasting four Mercury years. But that five days' worth of data has already tripled the number of measurements that we've made of the planet's magnetic field, and it has also reached to the full span of latitudes never before sampled by a spacecraft. The images that we are getting now will just refine a view of Mercury that we already have developed from the previous flyby data; these magnetometer measurements are ground-breaking, resulting in an utterly unprecedented data set. The same is true for the topography data now coming in from the laser altimeter. Why do this? Why not take as much color data as you possibly can, in order to map out Mercury's surface in detail? For one thing, it saves significantly on data space to take only eight instead of eleven colors. (The panchromatic or clear filter position wouldn't have been used for Mercury mapping in any case; it was included for optical navigation purposes.) For another thing, MESSENGER is always moving as it takes these sets of images, one after the other; taking images through a smaller number of filters reduces the amount of "drift" from the first image in each sequence to the last. But they wouldn't have gone to eight from 11 filters unless they were confident that they'd be able to get a sufficiently detailed color map of Mercury without the three that they're skipping. I asked about how they made that decision, and Sean Solomon confirmed that it was based on their experience with color imaging during the three flybys. Their image processing is able to tell them what they want to know about the variations in color across the surface without those three filters. Here's the first color image of Mercury, a false-color version of the one released last night. With the benefit of infrared imaging, Mercury's surface is patterned in blues and yellows. This false-color view of Mercury represents the start of MESSENGER's work to systematically map the innermost planet from orbit. MESSENGER's wide-angle camera has a filter wheel with 11 different color filters, some in visible wavelengths and some in infrared; different combinations of images taken in different filters can yield colorful views showing variation in surface composition. This image was made from three captured through infrared and blue filters.